On May 3, 2017, the Women Startup Challenge Europe showcased 10 amazing, women-led tech startups at a pitch competition held at City Hall in London. 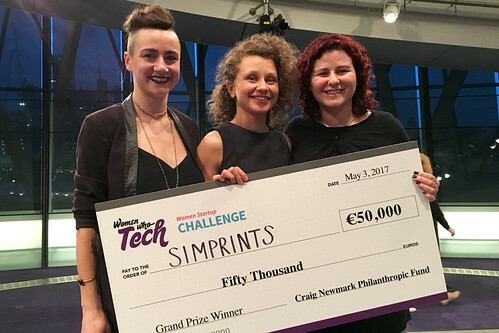 The €50,000 top prize was awarded to Alexandra Grigore of Simprints, a startup that aims to become the first identity provider for the 1.5 billion people who do not have formal IDs. UK based company Simprints has developed an inexpensive biometric scanner, mobile app, and cloud platform that could become the first identity provider for the 1.5 billion people who do not have formal IDs. By using people’s fingerprints to accurately link them to records, Simprints aims to create a world where lack of identity is never the reason why anyone is denied the services, care, and rights they deserve. Lifebit is creating the operating system of genomics. Their unified framework system enables insightful, real-time genomics analyses by making them easy to deploy, portable across clusters and clouds, scalable no matter the size of the data to be analyzed, reproducible, and more time and cost-efficient. Audience Choice Award: $120,000 in cloud services, courtesy of IBM, with other nine finalists receiving $10,000 in cloud services each. Sign up for updates about this and other Women Who Tech events.